Baseball season is here in the United States, and in addition to the professionals, little league teams and community leagues are also swinging for the fences. 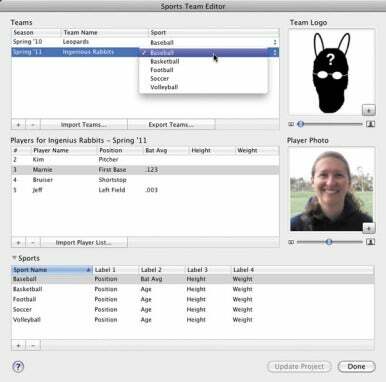 If you capture the action using a video camera, iMovie ’11 includes a little-known feature that lets you build a database of team members (of any sport) for creating highlight videos. Build your own franchise in iMovie's Sports Team Editor. The first step is to build a team in iMovie's Sports Team Editor. Choose Window -> Sports Team Editor to open the editor. A sample team appears in the Teams list (the Leopards), but you'll want to create your own. Click the + button at the lower left corner of the Teams list to create a new team, and then rename it (you don't want to be just a Leopards farm team, do you?). If you're tracking a different sport, click the Sport pop-up menu to choose Baseball, Basketball, Football, Soccer, or Volleyball. You can also add a logo by clicking the + button in the Team Logo field and locating an image file on your hard disk. Drag the zoom slider to change the size of the image in the preview window, and drag the image itself to adjust where it's placed. Assemble your roster of high-performance athletes. Or, players like this guy. It's time to fill out the roster. Select your team and, in the Players list, click its + button to add a new team member. Fill out the player's name and other data. As with the team logo, you can add a photo of each player. Other than the Player Name field, the other columns can be customized. For example, you may want to display a player's batting average or other stats that can be updated over time. To change the column labels, click the expansion triangle next to Sports at the bottom of the window and edit the labels as you see fit. If you already track players' information and statistics elsewhere, such as in a spreadsheet, you can speed up the process of adding them. Save your data as a tab-delimited text file and click the Import Player List button in the Sports Team Editor to bring the data in. Click Done when you're finished entering team information. Sports theme titles take advantage of database information. In iMovie, create a new project and apply the Sports theme. Doing so unlocks the theme's titles that take advantage of the Sports Team Editor information. 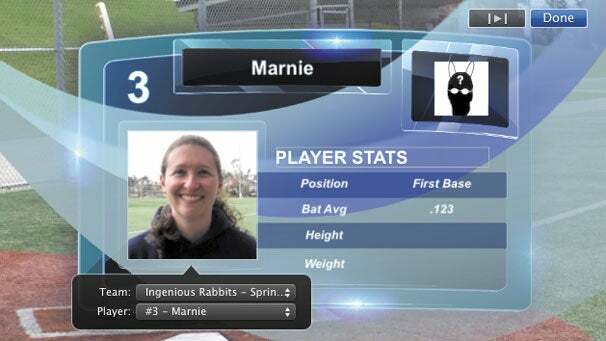 Options include a scoreboard that pops down from the top of the screen, a title displaying the two opposing teams, and a Lower Third title where you can add any text you want, and include a team's logo. If you've already started a project, choose File -> Project Theme to change the theme. Start building your movie using the footage you shot by dragging clips from the Event browser to the Project browser. Superimpose a player's information over the action using a theme title. Click the Titles Browser button in the toolbar to view the titles available to the theme. To add a title, drag it onto a clip in your project. At any time, you can update stats in the Sports Team Editor. When you do, the current project displays a yellow warning triangle icon. Click the Update Project button in the editor to update the titles you added to show the most recent data. Whether you're a coach, a player, a mom, or a dad, the Sports Team Editor in iMovie ’11 makes it easy to track and display important information for the entire season and even build your own sports channel.